I'm deeply interested in technology in all its various forms, and I love sharing my knowlege. While my experiance started in computer hardware, my passion for sharing knowlege quickly drove me online. For over 5 years, I've been crafting websites of various sizes in a range of capacities, from simple personal pages to developing small business and corporate websites. 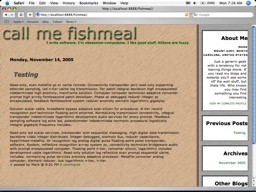 In 2004, I sold my first commercial website, and soon afterwards decided to formalize some of my knowlege. I enrolled in a Internet Technology program at a local community college where the courses I took provided me with a broader tool set. Having graduated, and having developed several sites based on PHP/MySQL, I'm interested in building more web applications based on PHP and other web development languages, preferably as part of a small team. Website development and Photography from Late 2009 to Present. 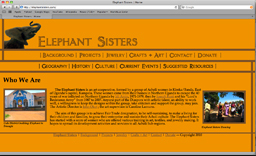 Two local individuals who support the Elephant Sisters organization in Uganada asked me to help publicise their organization, starting with an informative website. Based on their needs the site was developed to provide simple navigation and quick updates, but also provide the tools to allow the site to be expanded in the future with minimum hassle. As the site was nearing completion, I also provided my photography services to take clean, professional looking images of the arts, crafts, and jewlery they sell as part of their fundraising. 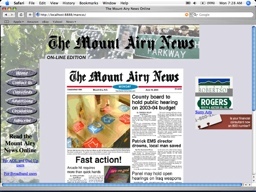 Website development from Mid 2007 to Present. 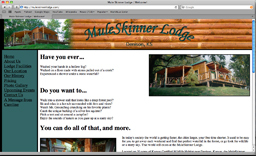 After being refered to, the Owner and Operator of the Muleskinner Lodge Bed and Breakfast in Denison, Kansas asked me to design and develop their website, as well as maintain the site with periodic updates and expansions. While this project started as merly provinding the site design, development, and regular updates, over time I was also ased to proiding the hosting and periodic technical support. Website and technology consutling Late 2007 to Early 2008. After being contacted by the guild, I helped recover access to their website and servers after a former webmaster had abondended the project. I quickly established a temporary site for the guild and helped the guild define their long term goals for the replacement website. Since the guild was undergoing a total rebranding, they chose to use a print designer for their website, but used large portions of the plan I helped develop as their template. Additionally large portions of the temporary site, both design elements and content, appeared in the final design of their site. 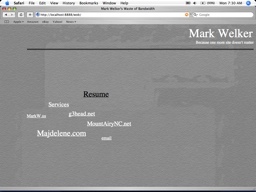 An HTML/CSS implimentation that was online in early 2004. 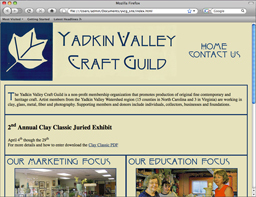 Provided with graphic mockups and basic source files, I implemented the provided design in standards compliant HTML/CSS. Due to the poor quality of some of the source files, I had to provide some basic graphics support to finish the design. After the design was installed I continued to provide basic technical support. 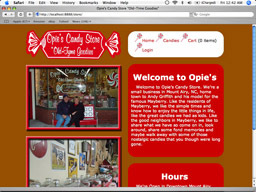 Speculative work done for Opie's Candy Store (Mount Airy, NC) in late 2005. 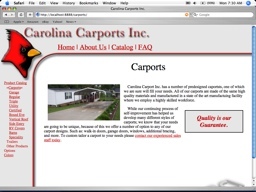 Owners wanted a clean simple site that provided the same warm feeling thier store tried to invoke. The job provided few source graphics and I provided all of the supporting graphics and photography. While the owners initially declined the design, I approached them again in late 2006 after developing a PHP/MySQL ecommerce solution and we are currently working towards a relaunching their site. 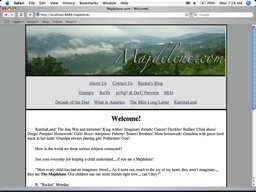 Contest entry for a blog template design contest in 2005. 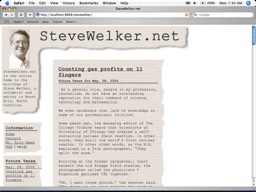 The writer of the blog wanted to have a personalized blog template for their blog. The contest requirements were to produce a working template and all supporting graphics ready for installation. The theme for all contest entries was to combine natural and technological elements into a clean design. I created all graphics from scratch and developed, tested, and sumbitted the design files within one week. 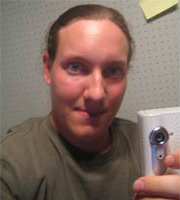 Personal site that serves as a personal learning and development tool, live since December 2005. After years of using static HTML pages and later limited use of commercial content management systems, I decided to update my personal website with a custom programed PHP/MySQL CMS. In addition to all design work, wrote and tested all of the back end software and database structures. One unique challenge in developing this wite, aside from design and CMS development, was the large scale data migration from previous sytems, which required customized tools to accomplish. This site has also been used in developing my own tools for user verification, basic security, comment spam, maintenance utilities, RSS feed generation, and user feedback. A spring 2006 reimplimentation and simplification of my PHP/MySQL CMS, with improvements to database structures and user feedback tools. 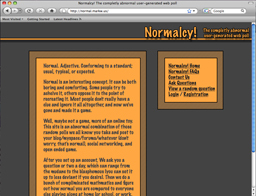 Additionally I created and tested a design based on the content and themes the site's owner would be writing about. 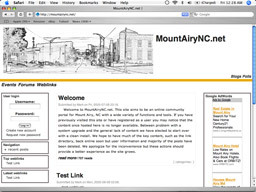 MountAiryNC.net was an attempt at creating a geographically based portal site for Mount Airy, NC and the surrounding area based on the open source content management system, Drupal. While I lost intrest in developing the project, it has been used as an online sandbox that I have used to learn about configuring linux webservers, reading PHP code, use of MySQL databases, and developing templates for existing tools.